To use Unified Communicator, a Unified Communicator license must be installed on the telephony software server. A license is required per user and can be obtained through the appropriate channel in the normal way. Note: To enable the Dial Through functionality associated with the application, your telephone system must be licensed and configured for DISA / auto-attendant features. For Unified Communicator to be fully functional your PBX needs to be configured for Mobex. Your PBX maintainer will be able to help you with this. Unified Communicator features such as Presence, Messaging and shared directory search require a data connection between the mobile client and telephony software Server. Unless a private network connection is available, your firewall/security software should be configured to allow CTI Server access to and from the internet. Unified Communicator clients supporting TLS connections use TCP port 21051 to connect to the server. Clients not supporting TLS (e.g. Unified Communicator for iPhone) connect using port 21050. Transport Layer Security (TLS) is an enhanced version of SSL which is used to encrypt the data stream between Unified Communicator and the telephony software Server. By default, Unified Communicator connects through TLS on port 21051. Note: If the client cannot connect on port 21051 it will attempt to make an un-encrypted connection on port 21050. To check if the mobile uses TLS, go to the telephony software Server (Sessions tab) and check on the list of connected devices if the mobile uses TLS connection. Unified Communicator user configurations can be pre-configured on the server so that the end user need only enter the IP address of the telephony software server after installing the app on the phone. The server recognizes the user's mobile device and automatically provisions user parameters. Note : Manual set up is also available – see the telephony software Server Installation Guide for more details. Unified Communicator uses the dialer presented by iOS (normally a GSM dialer) on your mobile device to make and receive calls – it does not install an IP phone. 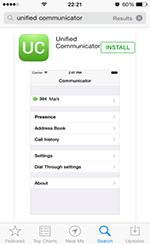 Unified Communicator can be downloaded from the App Store. The easiest way to find it is to search for "Unified Communicator". Installation from here on is simple. Click on Free App -> Install App, you will then be asked to enter your Apple ID and password. Once the credentials have been accepted, UC app will be automatically downloaded and installed on your mobile device. Before you can get started making calls with Unified Communicator, you need to configure the client, so launch the app by tapping the shortcut that has been placed in your iPhone Applications menu. When Unified Communicator opens for the first time, you will be presented with the Welcome screen. Tap the text box, then enter your telephony software Server's IP address. (Note: if your administrator has given you a TCP port number then you should add this to the IP address separated by a colon (:) e.g. 192.155.123.1:12345) Tap the Next button once the details are entered and then Unified Communicator will check to see if your system administrator has preconfigured your settings. If they have preconfigured your settings, the UC app should successful connect to the server and take you straight to your client menu (you can skip the rest of this section too). If your settings have not been preconfigured, you will see a screen giving you two options. Tapping Refresh will cause Unified Communicator to check again for your preconfigured settings. Use this option if you have contacted your system administrator asking them to setup your settings. To configure Unified Communicator yourself, tap Manual setup to open the Settings menu. Server address: The details you entered on the Welcome screen should already be in place here. If not, enter the IP address of your telephony software server. To use a specific port number, append it to the IP address using a colon e.g. 192.0.2.1:12345. You must append TCP port 21051 (default), or the port number provided by your administrator, to the public IP address as explained above. Deskphone extension: Enter the extension number that represents your deskphone on the phone system. This may be the same as your mobile extension. Mobile extension: Enter the extension number that represents your mobile device on the phone system. This may be the same as your deskphone extension but is more often a different virtual extension number. This can be left blank if the device is only used in deskphone mode. Username: Enter the username given to you by your administrator. This should match the username which is set up in your telephony software Server user settings. Password: The password you need to enter here is your telephony software Server User password that is set in your User record in the telephony software Server. Click on your device's "Done" button to save your settings and return to the main menu. At this point Unified Communicator is configured to connect to and communicate with your telephony software Server but you also need to configure the Dial Through settings to make full use of Unified Communicator. If your mobile client settings have been preconfigured by your System Administrator then the login options will be greyed out and unavailable for editing. To change the server your mobile device is registered with, click on the option which displays your current telephony software Server's IP Address, replace it for the new telephony software Server IP Address. 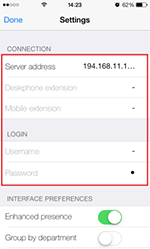 If your mobile client settings have been previously pre-configured on the new server then your client will automatically refresh the login and configuration settings and connect to the new server. If however, your device hasn't been previously preconfigured you will have to follow the steps mentioned in the Welcome Screen and Server Configuration Menu section for the manual configuration. Unified Communicator can use the Dial Through or Auto Attendant configuration capability of the telephone system to allow the UC user dial extension numbers or any external numbers from their mobile phones via their telephone system. Always Dial Through: When dialing an external number, the mobile phone user can decide whether to dial an external number directly through GSM or via the telephone system. The preferred method of dialing out is controlled by toggle button (slide your finger across the slider button to turn it ON or OFF). Dial Through number: Enter the pilot number for your DISA / Auto-attendant system. Enter the entire DID number to dial; entering only the last half of the DID number will not work. Pause character: Enter the character used by your telephone system to indicate a pause e.g. "," (a comma). 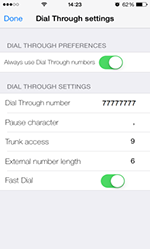 Trunk access: Enter the code used by your telephone system's Dial Through to access an outside line e.g. 9 is common. External number length: Enter the number of digits an external telephone number would be expected to have i.e. a telephone number with fewer digits than the value entered here will be considered an internal number by Unified Communicator. Fast Dial: Enabling Fast Dial will significantly reduce the connection times that are normally associated with Dial Through dialing; this feature requires Wi-Fi/3G or better (slide your finger across the toggle button to turn it ON or OFF). Click your device's "Done" button to save your settings and go back to the previous menu. At this point Unified Communicator is configured to connect to and communicate with your telephony software Server as well as make and receive Dial Through calls. Warning: Your mobile provider may charge you for data services used from your mobile device. Warning: Enabling the telephone system for these features may require additional licenses to be installed on the telephone system.